Review Fun Fact: “Mr. Memory” was based on an actual vaudeville-like act. 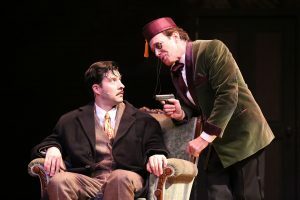 In fact, the sole member of the frenetic cast who seems to depict only one character is Eric Wentz as the lead, Canadian Richard Hannay, who stumbles into a world of intrigue when he buys a ticket to a London variety theater. Along with the opening night audience at Long Beach’s International City Theatre, Wentz had fun lampooning the Hannay of Manchester-born Robert Donat, who personified the Brit persona for Yankee moviegoers in 1930s classics such as The Count of Monte Cristo and Goodbye, Mr. Chips. Onstage, there are references galore to various other Hitchcock pictures sure to delight vintage film fans. Snatches of composer Bernard Herrmann’s scores from movies such as North by Northwest are heard. (Sound designer Dave Mickey’s recorded soundtrack enhances the revelry throughout.) Psycho’s shower stabbing scene is depicted via shadow puppets on what appears to be a shower curtain. The action onstage unfolds at a fast pace like in those rapidly edited montage sequences in Saboteur, Psycho, etc. 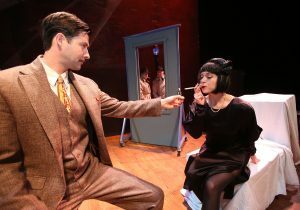 The play’s pithy patter refers to pictures like The Lady Vanishes, Vertigo, Rear Window and The Man Who Knew Too Much. Cinefiles are more likely to know about the 1956 color version of the film starring Doris Day and Jimmy Stewart, but this is a remake of Hitchcock’s 1934 The Man Who Knew Too Much, the movie co-starring Peter Lorre that he shot just before making The 39 Steps. The black and white original iteration opens at St. Moritz, that posh Engadine Valley village surrounded by the Swiss Alps, and includes scenes of outdoor sports and a luxury resort that appears to be Badrutt’s Palace. Switzerland left an indelible impression on Hitchcock’s mind and the movie he shot immediately after 39 is likewise set in part at the Alpine nation. 1936’s Secret Agent, co-starring Madeleine Carroll, Peter Lorre, John Gielgud and Robert Young, also has Swiss scenes and is another one of Hitch’s forays into the realm of international intrigue, derived from a Somerset Maugham novel. Hitchcock co-wrote, but did not direct The Prude's Fall (also known as Dangerous Virtue). He’s also accredited as the movie’s art director, assistant director and apparently acted as a location scout, too. Searching for places to film is how Hitch first stumbled upon St. Moritz and Lake Como, although Prude’s was unable to shoot any scenes there due to weather conditions, according to John Russell Taylor’s 1978 biography. 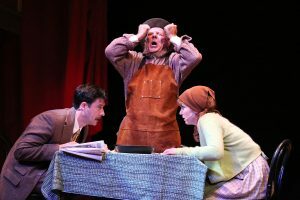 Theatergoers can also pay tribute to the Master of Suspense - and their funny bones - by enjoying the rib-tickling The 39 Steps, drolly directed by Jamie Torcellini at one of L.A. County’s finest playhouses. 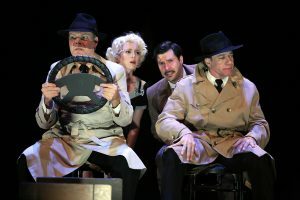 The 39 Steps is being performed Thursdays, Fridays and Saturdays at 8:00 p.m. and on Sundays at 2:00 p.m. through July 8 at the International City Theatre, Long Beach Performing Arts Center, 300 East Ocean Blvd., Long Beach, CA 90802. For more info: (562)436-4610; https://ictlongbeach.org/. The third edition of “The Hawaii Movie and Television Book” co-authored by L.A.-based film historian / reviewer Ed Rampell is now available at: https://mutualpublishing.com/product/the-hawaii-movie-and-television-book/ .